Konnichiwa. Watashi wa Veronica de‚ Eigo no sensei desu. I studied English teaching in the UK specializing in Grammar‚ Business English‚ Teaching one to one‚ and Teaching young learners. I also studied Japanese and can speak Japanese at conversation level. Nihonggo Center Manila de Nihonggo o naraimashita. I have experience teaching Japanese for 6 months when I was in Japan. 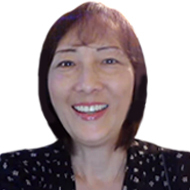 I am currently teaching English on line to all levels. Nihonjin seito o sagashimasu. Mata yoroshiku onegaitashimasu.